Ready to excite that sweet tooth of yours?! Well, then have I got a fun DIY project for you! This craft is admittedly a little outside of my comfort zone, but I have had it in my head for months now, and just had to bring the idea to life before my busy travel season kicks off next month. 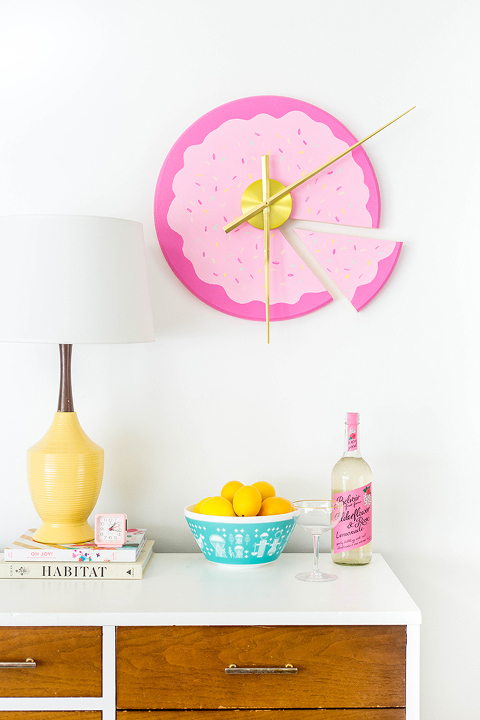 It’s bright, it’s bold, it’s cheeky, and a little wild, but I invite you to read on to to learn how to make your own version of my DIY Sliced Cake Wall Clock! 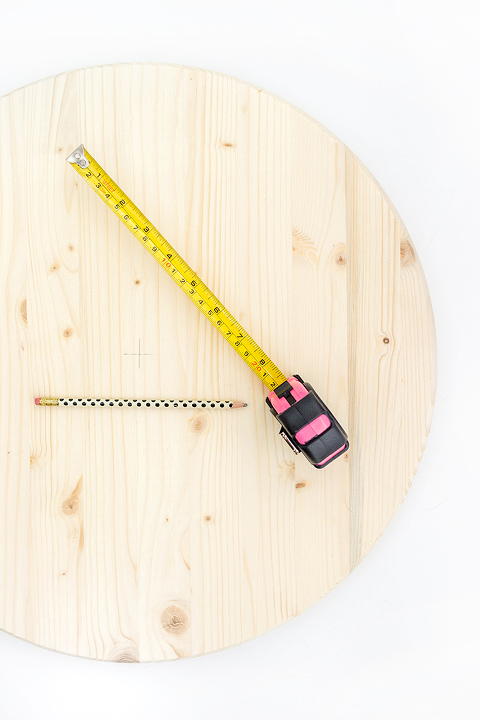 Start by finding the center of your wood round using a tape measure and pencil. Then use your tape measure and pencil again to draw out a small wedge from the edge of the wood round to the center mark. You won’t want to make your wedge go all the way to the center though since you need room for your clock mechanism. Lightly draw your wedge with the pencil using the measuring tape as a straightedge. As you can see for my wobbly lines, it doesn’t need to be perfect. The wedge slice will be pretty self-explanatory in the end, so no need for mathematic precision unless you want to go that far with it. With the wedge drawn, put on safety glasses and clamp the wood round to a work bench. Outfit your jig saw with a blade meant for clean cuts, and then slowly and carefully cut out the wedge slice. Sand any uneven edges with sandpaper before moving on. Prime the wood round and wedge slice with white acrylic or chalk paint, and then add a skin-toned acrylic paint color to the inside cut edges of the wedge slice and the main wood round body. This will make the cuts look like the inside of a sliced yellow cake. Using a foam paintbrush, paint the top of both the wedge slice and the main wood round body in your color of choice, giving the edge a slightly wavy line to represent icing. Add a darker version of your chosen main paint color to the outside of the wedge slice and wood round to represent the icing border. Finish by adding tiny multi-colored sprinkles using more acrylic paint and a detail paint brush in your favorite colors, and then add your clock mechanism using the instructions that come with your hardware. 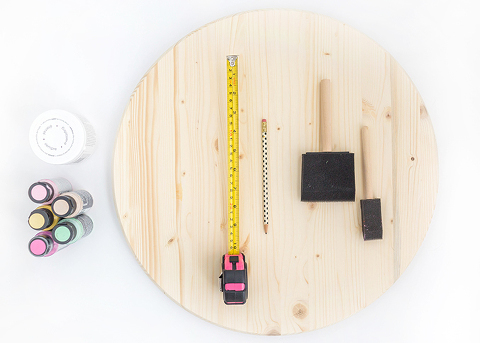 To hang the clock, add a sawtooth hanger to the back of the main painted wood round, and a heavy-duty 3M picture hanging strip to the back of the slice. The 3M tape will allow you a little wiggle room when hanging the slice on the wall just a little off center from the wood round. And with that, you’re done! I love the final pop of color and personality, and especially adore the hint of that yellow cake interior that you can see from off to the side. This is a funky project that, although a little outside of my comfort zone like I said, was a fun creative challenge. I think it would be just perfect in an art studio, child’s room, or even a commercial bakery! Would you give it a try?